Will Colton (The Hoff) is a man who swears by his awesome hat, beard stubble, mullet, tight jeans, cowboy boots and jacket. He also has a pet puma named Felix. He returns to his old hometown of Goldcrest, and begins fixing up his old homestead. However, that does not sit well with the local biker gang, called The Vipers. Through their forceful intimidation tactics and a frightened populace (of only 3000 people), The Vipers run Goldcrest. It’s also because the leader of the gang, an albino named Ghost (Saxon) has a corrupt relationship with the Sheriff, Whistler (Hopkins). So it’s up to Will Colton to clean up this town, with the help of new love Carrie (Moore). As if that wasn’t enough, an event in Colton’s past drives him to get revenge on The Vipers. Will he succeed? Hasselhoff should have been in more movies like this. It plays to all of his strengths. He even runs in slow motion at one point. The Final Alliance is a lot of fun, though it’s nothing, plotwise, you haven’t seen before. The “stranger comes to town and cleans up said town” has been around since time immemorial and if you’ve seen Walking Tall: The Payback, Nowhere To Run, Street Corner Justice, Radical Jack, and Fire Down Below, among many other possible examples, you’ll know what we’re talking about. It’s all very David Heavener-esque (let’s not forget to add Outlaw Force to the list), but somehow, someway, The Hoff makes it work. Just as he unfailingly has done for his entire career. Casting John Saxon, a man of Italian descent, as an albino was certainly an interesting choice. The role seemed tailor-made for Richard Lynch, but perhaps he wasn’t available. Saxon’s ghoulish appearance adds something to the overall feeling. Bo Hopkins also puts in an inspired performance (read: insane) and he yells most of his lines. It’s truly a pleasure to watch Saxon, Hopkins and Hasselhoff in this outing. It doesn’t get much better than The Hoff as a former mercenary with a proficiency in booby traps. 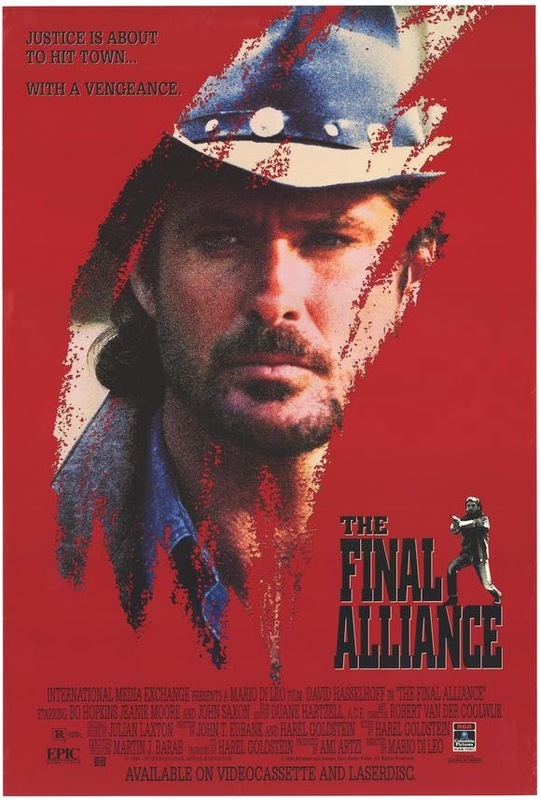 There are the time-honored stand-bys such as the abandoned warehouse fight and barfight, and the fact that this movie is from 1990 and shot in a foreign country is evident pretty much all the time. Prime examples include plenty of stonewashed denim, Hoff’s first nemesis is a dude in a Manowar half-shirt, the town has a combination general store/video store (complete with posters for The Untouchables, among others), graffiti on the walls says “Dead People Are Cool” (???) and the word “Tobacco” is spelled incorrectly on another sign in the small town, which feels very much like a Western set. And of course, the sax on the soundtrack. Director DiLeo has fashioned an entertaining, if incredibly undemanding romp that’s not to be taken too seriously. 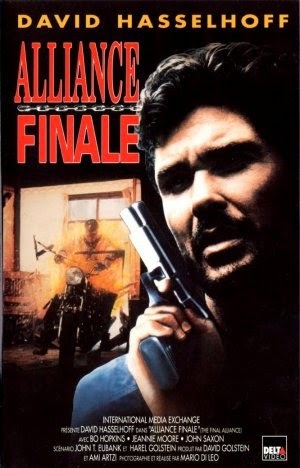 While we’re not exactly sure what “the final alliance” refers to in the saga of Will Colton, you’ll be pretty much guaranteed a night of silly fun if you can find this VHS. You are right, this is silly fun! I have the LaserDisc of this one, haha. Haha nice! Hoff on Laser.